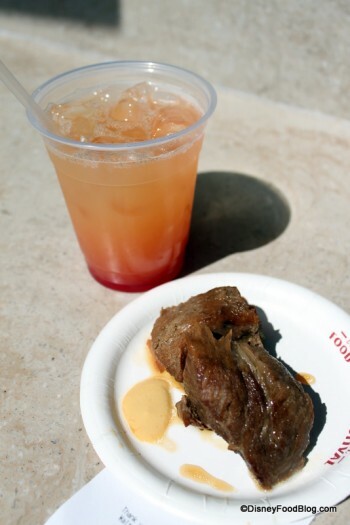 It’s time for more 2011 Epcot Food and Wine Festival booth food pictures! Today, we’re headed to Asia and will be visiting Japan and China! Japan introduced a couple of new items to the menu this year, including Pork Kakuni and the Tokyo Sunset — both can be seen below. The pork serving was massive and very good. The Tokyo Sunset, a mix of pineapple juice, banana liqueur, peach schnapps, and coconut rum, was delicious. We’re headed out to the 2010 Epcot Food and Wine Festival again today, but first I wanted to share a few more of the items we sampled yesterday! Don’t forget, to see full coverage of each booth — including food pictures, menus, and pricing — check out our Epcot Food and Wine Festival Booth Pages! Just click on any booth name for detailed information! 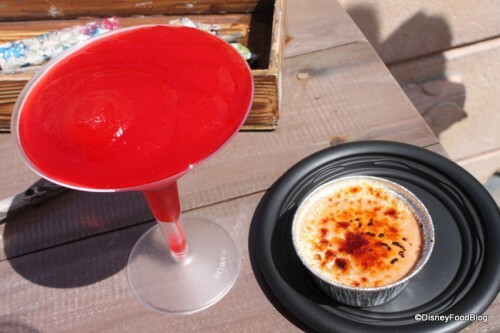 We sampled the Cosmo Slush and Milk Chocolate Creme Brulee yesterday — both incredible, but I was really taken with the Cosmo Slush!! Of course, the escargot and Short ribs are back again this year, too! You can see more pictures, the full menu, and prices on our France Booth Page!